At Outlook Matters Psychology we offer a full range of services for adults, children and adolescents. These include educational/academic assessments, parenting support, career assessments, expressive therapy and general counselling. 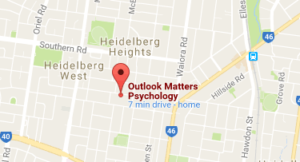 Located in Heidelberg Heights our clinic services Melbourne’s northern suburbs and our team of friendly, highly skilled and professional psychologists shares a wealth of experience across a broad range of specialisations. We can offer sessions in Mandarin Chinese (for children and their families) with our native Mandarin-speaking psychologist. Various fee rebates are available upon receipt of referral by a GP, paediatrician or psychiatrist. Ask us for more information. We offer a range of psychology services for children, adolescents, parents and families. Common areas that we treat include: behavioural issues, social and emotional difficulties, anxiety, ADHD, Autism Spectrum Disorder, Asperger’s Syndrome, bullying and more. Help your child to improve their learning skills, find their strengths and thrive at school. We offer comprehensive assessments for cognitive and academic skills, giftedness and specific learning disabilities (i.e. dyslexia), as well as vocational assessments (ideal for secondary school students). Our services include the assessment and treatment of a wide range of mental health problems. Discover practical strategies for relieving psychological symptoms, and develop a realistic plan for getting back on track. Boost your resilience! Our evidence-based approach to counselling and psychotherapy can assist you to solve a wide range of life and relationship concerns, develop a sense of wellbeing and prepare to make lasting change. Our psychology team services Melbourne’s northern suburbs – including Ivanhoe, Heidelberg, Heidelberg Heights, Kew, Preston, Thornbury, Bundoora, Rosanna, Reservoir, Bellfield, Viewbank, Montmorency, Mill Park, Greensborough and Macleod. We treat General mental health and wellbeing, Depression, anxiety and panic, Life transitions and adjustments, Learning difficulties, Child behavioural issues, Assessment of autism and developmental delay, Psycho-educational assessment, Parenting support, Career assessment and transition, Work issues, Relationship difficulties, Family issues, Pain and injury rehabilitation, Trauma (recent and past), Grief and loss, Bullying, Body image concerns, Social and emotional difficulties.